This Gluten-Free Vegan Cream of Mushroom Soup is a one-pot meal that’s ready in less than 30 minutes and made with clean ingredients. I used to not be a big fan of mushrooms, but for some reason, I love them now! 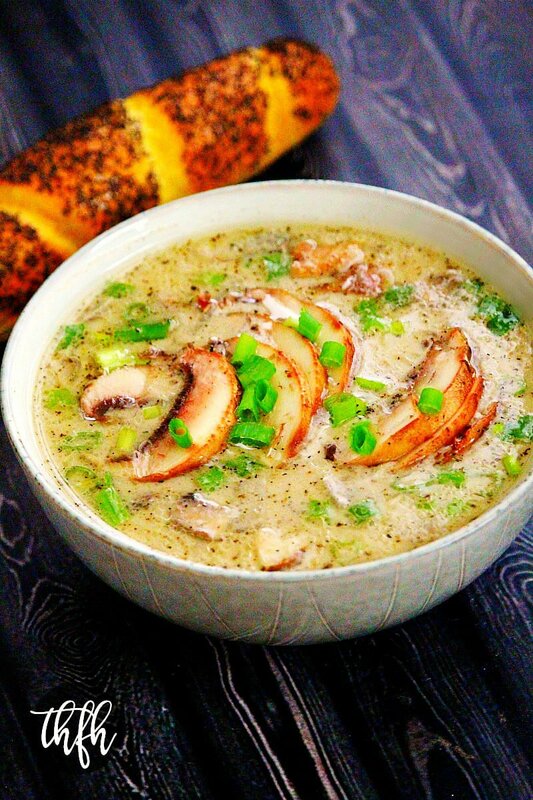 I’ve already shared a couple of mushroom soup/sauce recipes, but this one is a little different because the mushrooms are sliced and diced instead of being blended. So there are pieces of soft mushrooms in each bite. Yum! 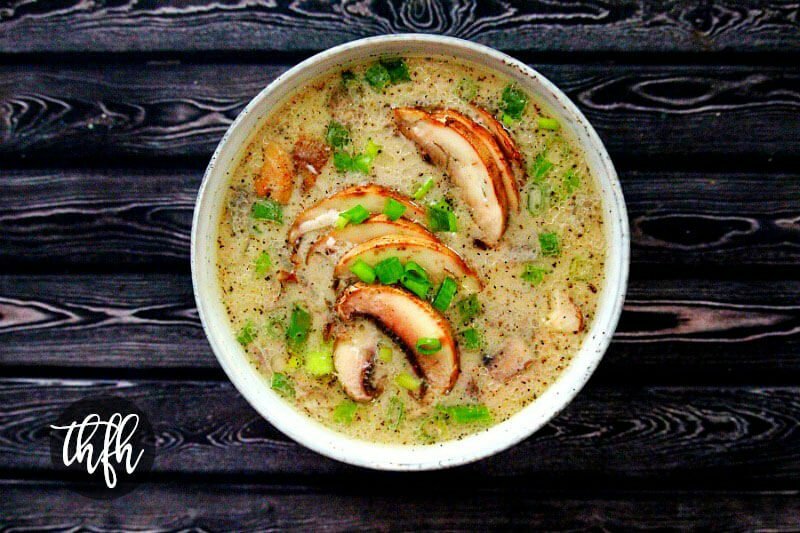 If you like the ~taste~ of mushrooms, but don’t like the texture, you may want to try Raw Vegan Cream of Mushroom Soup, Creamy Mushroom Sauce or even Pasta with Asparagus and Creamy Mushroom Sauce recipe, where the mushrooms are blended in a Vitamix so the flavor is there but not the texture. And if you~do~ like the texture of mushrooms, you will love this recipe and you may want to try Cheesy Sprouted Brown Rice with Baby Spinach and Mushrooms, Portobello Mushroom Pave with White Asparagus Vinaigrette or an older recipe, Vegan Mushroom Lasagna. It’s a can containing of GMO’s (canola, soy) and is not vegan or gluten-free. This healthier version is made with clean ingredients and is vegan, gluten-free, dairy-free, nut-free, lectin-free, alkaline and paleo-friendly. Want more healthy soup recipes? Check out Creamy Vegan Tomato Basil Soup, Vegan Cream of Asparagus Soup, Vegan Spicy Roasted Red Pepper and Garlic Soup or my Clean Eating Cookbook with over 140 healthy, clean eating recipes just like this one that you will love! Add the following to a medium-size sauce pan: avocado oil, mushrooms, onions, garlic, Himalayan pink salt, black pepper, dried thyme. Saute on medium-high heat for approximately 2-3 minutes, or until the onions and mushrooms are soft. Add the veggie broth, coconut milk and coconut aminos and stir in. Adjust seasonings to your preference. Reduce heat to medium-low and simmer for approximately 10-15 minutes, stirring occasionally. Optional: garnish with extra sliced mushrooms, ground black pepper or chopped green onions. The recipe and photographs for "Gluten-Free Vegan Creamy Mushroom Soup" by Karielyn Tillman of The Healthy Family and Home website are licensed under a Creative Commons Attribution Non-Commercial No-Derivatives 4.0 International License and cannot be used without my written permission. This was delicious! I am staying away from grains and trying a low pectin diet for autoimmune reasons and this soup was perfect! I added a splash of fresh lime juice for a little zip;) thank you for sharing this recipe! Hi there Kelley! I’m so glad to hear you enjoyed the recipe! I love the addition of a touch of lime juice to it…what a great idea!